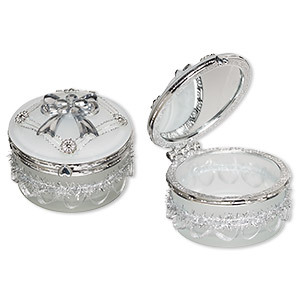 Trinket box, vintage acrylic / glass / silver-finished acrylic, frosted clear, 3 x 2-1/4 inch round with mirror. Sold individually. Item Number: H20-2743GF Have a question about this item? 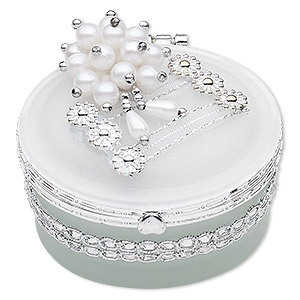 Economy grade frosted acrylic box with light-duty hinge and rhinestone ribbon accent for gifts, packaging, counter displays and add-on sales. Contains mirror inside lid. Colors, shapes and sizes may vary in each lot. 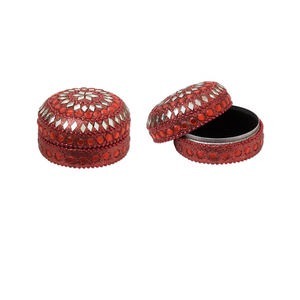 Box, aluminum / acrylic / glass, red and black with glitter, 2-1/4 x 1-1/4 inches with beaded chain and diamond design. Sold individually. 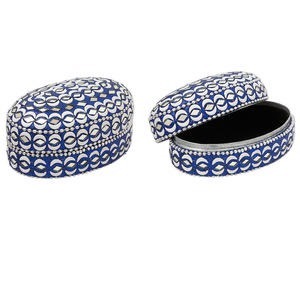 Box, acrylic / glass / silver-finished acrylic, white and frosted clear, 3 x 2-1/4 x 2-inch oval with mirror. Sold individually. Box, aluminum / felt / acrylic / glass, multicolored with glitter, 3-1/2 x 2-1/4 x 1-1/4 inch oval with beaded chain and diamond with crescent moon design. Sold individually. 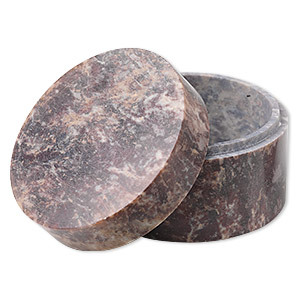 Trinket box, soapstone (natural), 1-1/4 x 2-1/4 inch round. Sold individually. 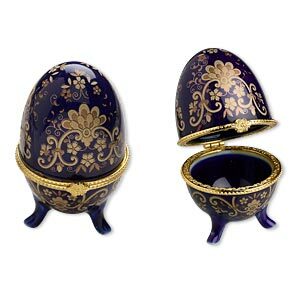 Trinket box, porcelain and gold-finished acrylic, dark blue and gold, 3x2-inch egg with floral decal. Sold individually. Box, aluminum / felt / glass, gold / black / blue with glitter, 3-1/4 x 2-1/4 x 1-1/4 inch oval with beaded chain and diamond design. Sold individually. 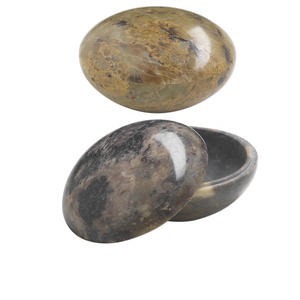 Trinket box, soapstone (coated), assorted colors, 2x1-3/4 inch round, Mohs hardness 1 to 2-1/2. Sold individually. 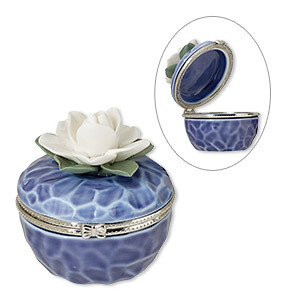 Trinket box, porcelain / imitation rhodium-finished brass / steel, multicolored, 2-1/2 inch textured round with flowers, leaves and bow. Sold individually. 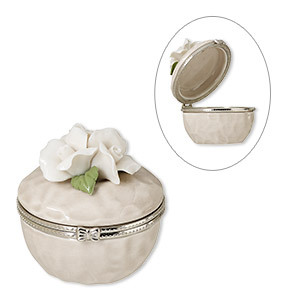 Trinket box, porcelain / imitation rhodium-finished brass / steel, white / tan / green, 2-1/2 inch textured round with flowers, leaves and bow. Sold individually. 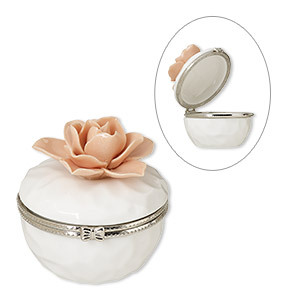 Trinket box, porcelain / imitation rhodium-finished brass / steel, white and pink, 2-1/2 inch textured round with flowers and bow. Sold individually.